Today's tea review touches on an offering from Numi, a tea company specializing in organic, bagged tea offerings. They have a wide distribution among hotels, and I acquired this bag on a recent business trip. Initially, the name struck me. My familiarity with aging teas has been limited to pu'erh, and the general rule is that most teas do have a shelf life. They can be consumed past that period of time, but it should not be expected that their freshness of aroma or flavor will still be present. Subsequently, describing a tea as aged, when it is not a pu'erh, was a bit of a red flag to me. 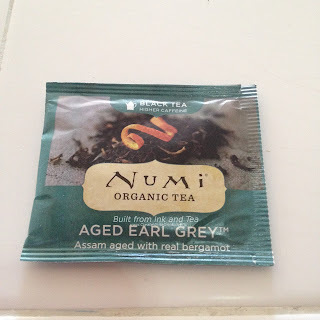 According to Numi's website, they make their Aged Earl Grey by aging "organic Assam black tea with real Italian Bergamot for several weeks so the tea absorbs the orange scent." I have to assume that this means they store the tea with actual bergamot oranges for several weeks, since the bergamot oil, blended with the tea, is permanently combined with it. Thus, it would seem that the aging process embodies more of an aroma-steeping than anything else. 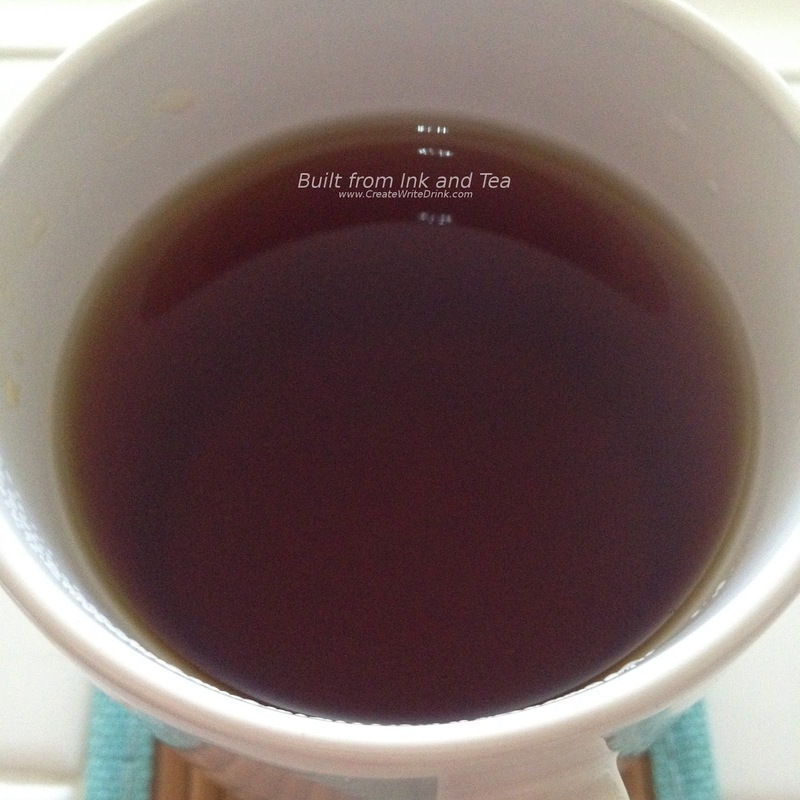 Tea does quite well absorb scents of any aromatic items nearby, so I can see the viability. The aroma of the bagged tea smells heavily of bergamot. Unlike a tea, such as Stash's Double Bergamot Earl Grey, the scent is not heady or thick. Rather, it has a more intensely-fruity bergamot smell. Using just-boiled water, I steep the bag in eight ounces of water for five minutes, the upper end of what is recommended. The resulting cup shines darkly, albeit a bit murky. The flavors definitely embody an Assam, the maltiness blending okay with the heavy citrus. The bergamot, though, tastes bitter, not as fruity and smooth as it smelled. In fact, the more I drink, the less I notice the bergamot and the more I just taste Assam. This could in part be solved by an application of less steep time or a touch of milk. The aftertaste, sadly, is weak in flavor, even for an Assam. 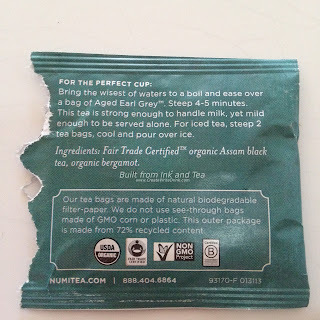 I feel as though this definitely results from the quality of the tea base, an unfortunate shortcoming of many bagged teas (though there are exceptions). Except for an extra touch of fruitiness to the nose, this tea hardly seems to set itself apart from a standard Earl Grey. If you encounter it, give it a try, but otherwise I would not spend your time seeking it. On my personal enjoyment scale, I would rate this tea a 62/100. Numi's Aged Earl Grey is available from their website, here.